Alvento Winery is located in Vineland Ontario near Lake Ontario on a sandy loam terrior. 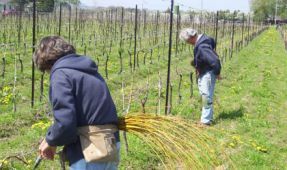 The Winery plants 5000 vines per hectare and focuses on the Cabernet Sauvignon, Cabernet France, Merlot, Nebbiolo, and Viognier grapes to produce some of the best wines in the Niagara Peninsula. Grapes are grown all year long and the selection of the grapes is all done by hand. The fermentation is handled in stages starting with the stainless steel barrels, then maceration and then a long period in the French oak barrels. Created in 2001, Alvento Winery strives on producing quality wines for customer satisfaction. The Tours at this winery are available by appointment only. Please contact the winery directly for further details.